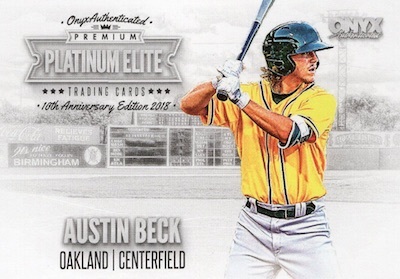 Celebrating a decade of premium trading cards, 2018 Onyx Platinum Elite Baseball also doubles as the 10th Anniversary Edition for the prospect brand. The primary 2018 Onyx Platinum Elite Baseball checklist features standard base cards and on-card autographs alongside a rainbow of numbered foil parallels, including hand-numbered Blue (#/200), Green (#/50), Orange (#/25), Red (#/10), Purple (#/10), Gold (#/5) and Black (1/1). There are also buyback autographs from prior Onyx sets. 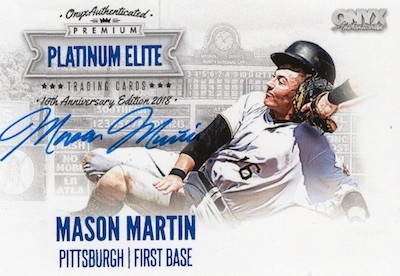 Each one-pack 2018 Onyx Platinum Elite Baseball box includes at least two prospect autographs, while every 24-box case produces a case hit that is a notable rookie or prospect card from a major manufacturer. 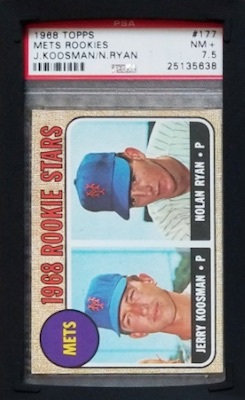 This includes iconic vintage rookie cards like the 1968 Topps Nolan Ryan, and many others. 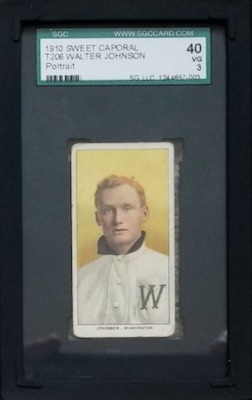 Found in graded and ungraded form, some versions are issued as redemptions. 2018 Onyx Platinum Elite Baseball has very limited production with only 80 cases (or 1,920 boxes). 2017 Onyx Platinum Elite Kevin Maitan AUTO Autograph Green Ink # 32 50 ! 2017 Onyx Platinum Elite Ronald Acuna Autograph #RA-PE 17 RC! PARALLEL CARDS: Blue #/200, Green #/50, Orange #/25, Red #/10, Purple #/10, Gold #/5, Black 1/1.